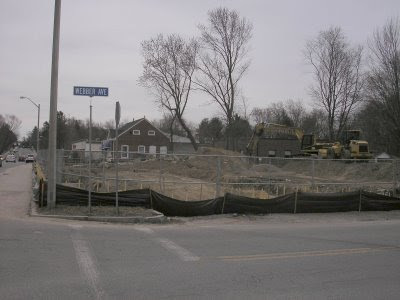 With the start of warmer weather, construction has started on the new location for Cambridge Savings Bank at 181 Great Road. This replaces the old Mobil gas station. Construction should move forward fairly quickly this spring. Along with the new building, the sidewalk along Great Road will be improved and extend on to Weber Avenue but only the length of the building (the remainder of Weber Avenue does not have any sidewalks). The new bank will face Great Road and features a dual lane drive-thru. The last few years have seen a large increase in bank branches across the US. According to my count, there are 10 bank branches in Bedford. With the economic downturn it will be interesting to see if banks begin to consolidate their branches. Yet another store opens on the Blake Block. 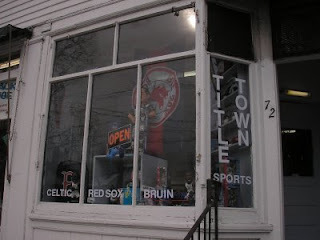 Title Town Sports located at 72 Great Road, recently opened. 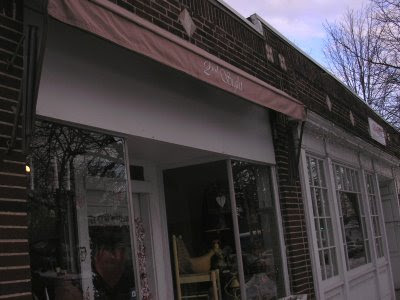 This store front was the previous location of Cuzz's Candy and Novelties which opened last August and closed in January. A second antique store has recently opened on the Blake Block at 76 Great Road. This location was previously used by the Bedford Historical society. According to Jan McGrath who runs Corner Antiques a few doors down, the new store owner (who is a friend of Jan) has not yet decided on a name (she may decide to keep the old Second Sight name).